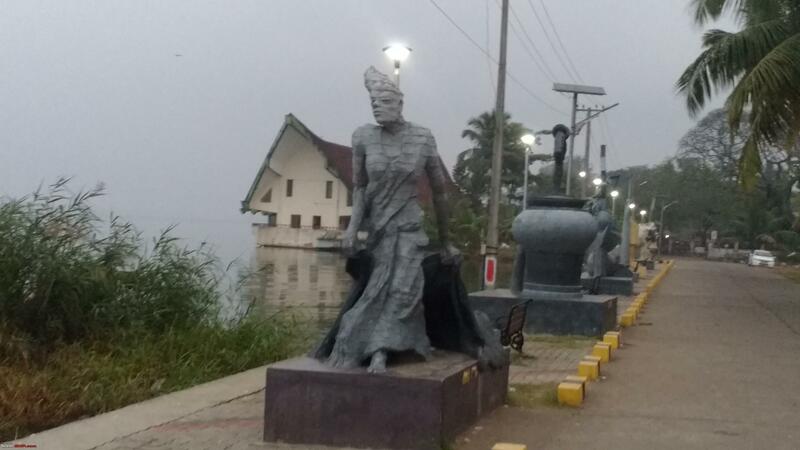 With Kerala recovering slowly after the floods, the news of the launch of a new transport connection in the first week of November 2018 between the central Kerala town of Vaikom and the commercial hub Ernakulam (Cochin) did not receive much attention outside the state. However for water transport operations in the state, it was a landmark event. 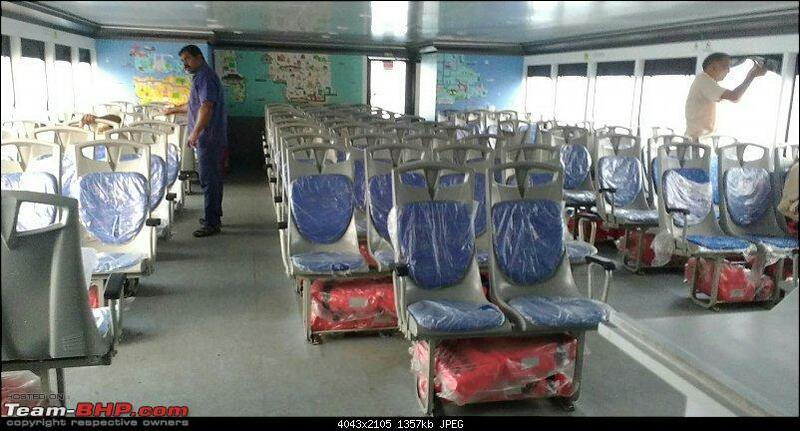 A new high speed ferry "Vega 120" operated by the Kerala Government's State Water Transport Department (SWTD) finally started operations after many promised launch dates had come and gone. With my interest in travel by public transport in my home state , particularly on routes less travelled, it was inevitable that a trip on the "Vega 120" would be part of my itinerary on my next trip home to Kerala which materialised towards the end of January . "Vega 120" is a fast ferry which does the journey in around 90 minutes. This is comparable to buses which usually takes the same time if not more during peak hours for the 35 km trip. 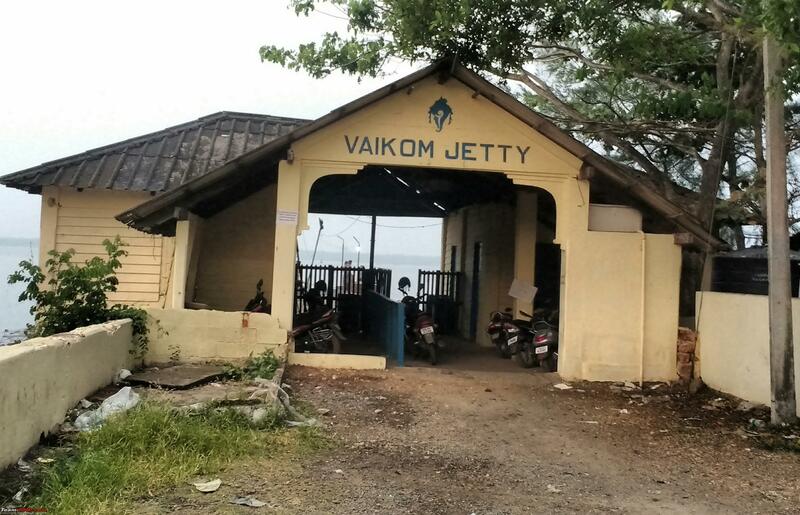 The ferry operates daily and leaves Vaikom at 0730. 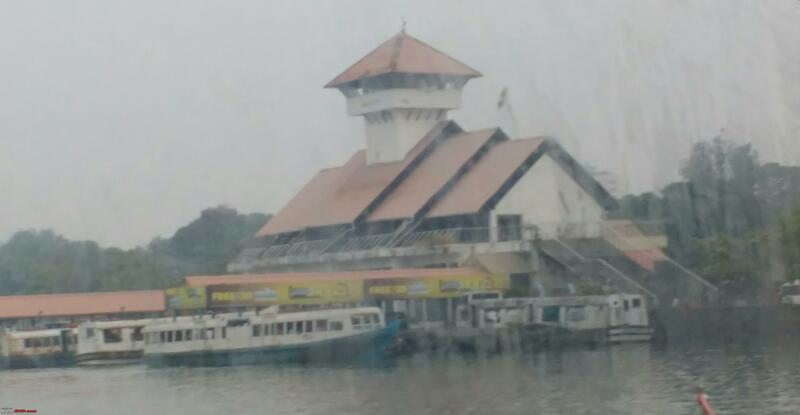 In the return direction, the departure from Ernakulam main ferry terminus (the same place where the ferries to Fort Kochi leave) is at 1730 hours. In between the ferry does around 6 round trips to Fort Kochi. 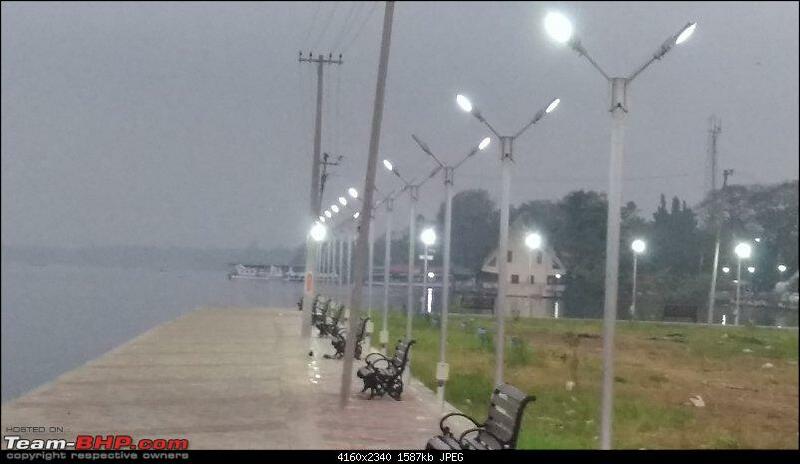 The timings are tailored towards the office goers commuting from the Vaikom side. However the weekends reportedly see some domestic tourists also. 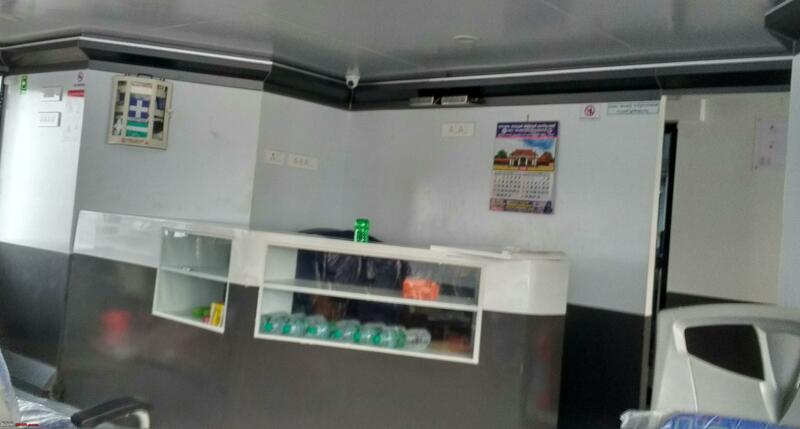 It is a pleasant way to have a backwater cruise in the Vembanad lake at very economical prices in an impeccably maintained (as of now) government operated ferry. Since darkness sets in between 6 to 6.15 PM (according to the conductor). 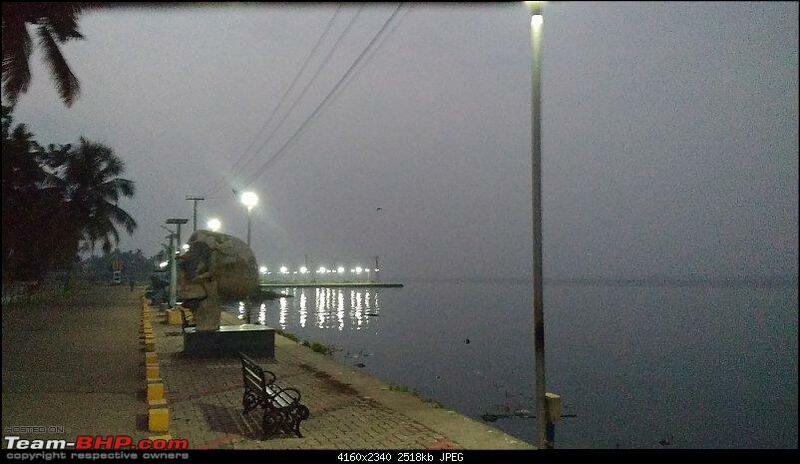 the best way to enjoy travelling in "Vega" is to take the morning service on the Vaikom- Ernakulam direction. I did the trip on a Friday morning. 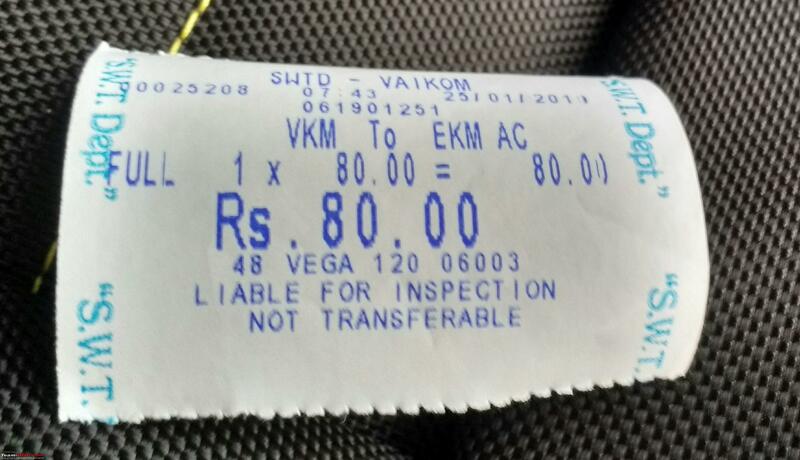 Caught a bus from the main Kerala SRTC bus station at Ernakulam at 5 AM and reached Vaikom way too early by 6 AM. 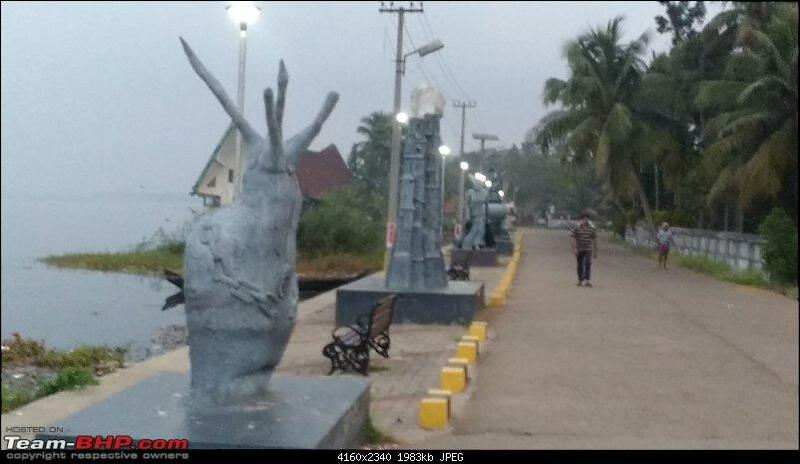 The boat station at Vaikom is a 15 minute easy walk from the KSRTC bus terminus. 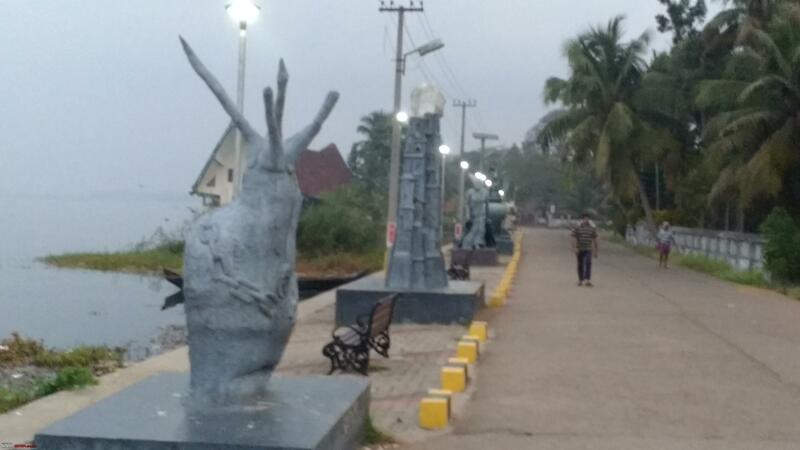 Vaikom boat station is reasonably well maintained and also has regular ferries across the lake to Pallipuram , around 10 kms from Cherthala which takes about 20 minutes and costs Rs 4 (yes you heard it right !). 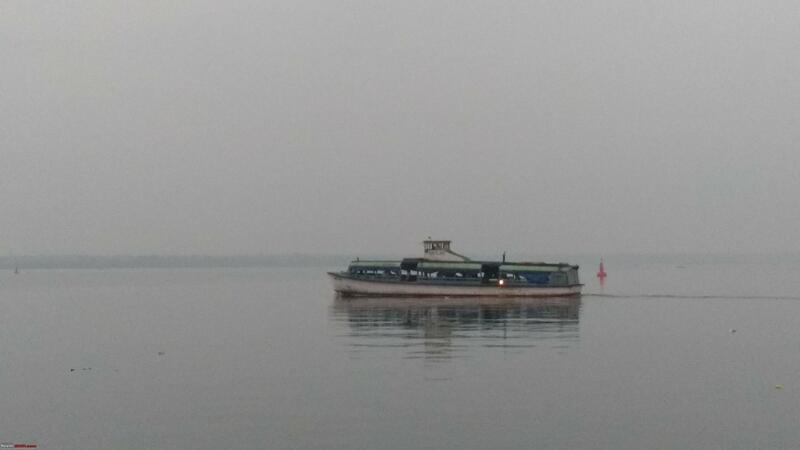 One of the local ferries. A friendy staffer at the boat station sugggested that since I have time to spare before the Vega departs , I walk to the main beach accross a well lit walkway which starts adjacent to the boat station. 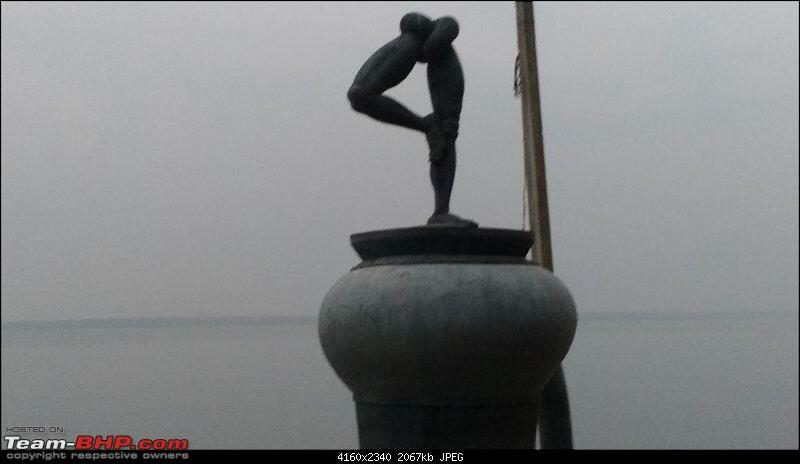 Dawn was just breaking and the walkway is beautifully maintained by the local authorities, with the lake on one side. Very well lit with music from a local FM station being played through speakers in a low volume accross the stretch, this place is very popular with the local citizens who come for their morning walk. 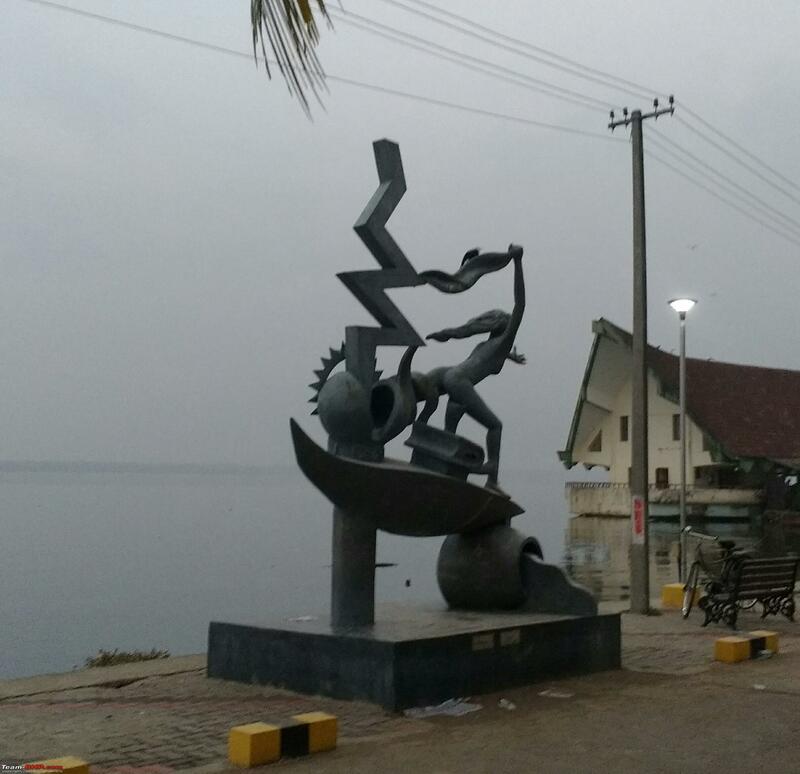 Facing the lake , in the walkway there are about 10 sculptures depicting the various events in the historic "Vaikom Satyagraha" all done by local artists. Plenty of comfortable seating is available to enjoy the early morning breeze. 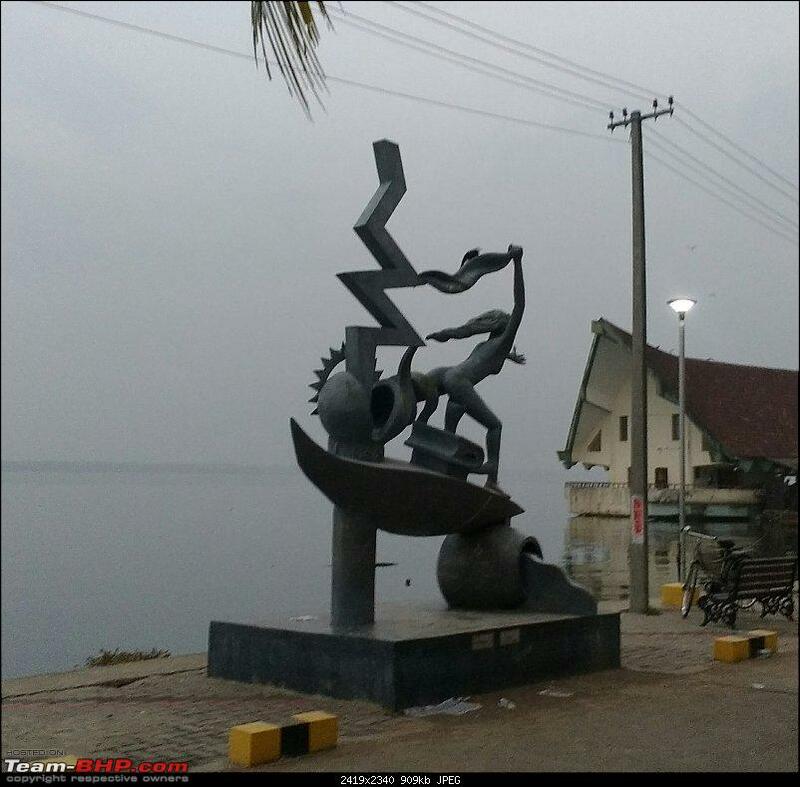 The people of Vaikom are indeed fortunate to have such a well maintained facility provided by the local authorities. Apologies for the poor picture quality as they are shot with my very basic Moto G3 camera in the early morning light. Last edited by TKMCE : 31st January 2019 at 23:15. 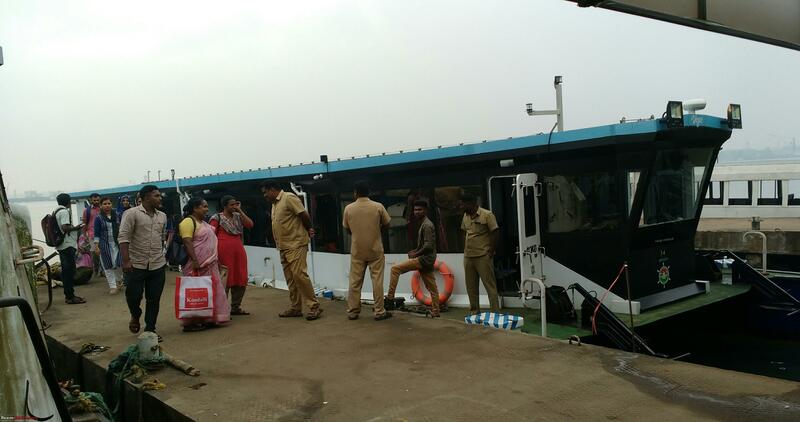 I was back at the Vaikom Ferry terminal by around 7 AM. The Vega departs from the old pier . 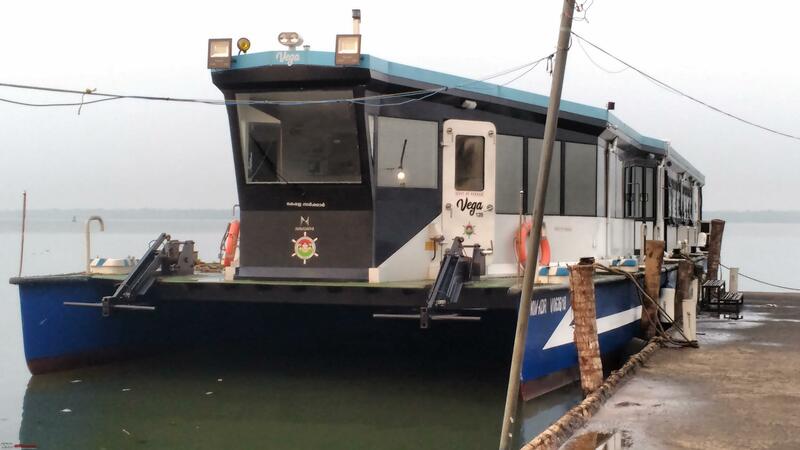 The "Vega 120" is a partly Air Conditioned fast ferry built by Navgathi Marine Design and Construction which also built a solar powered ferry "Aditya" which is among the ferries which operates the short hop on the Vaikom-Pallipuram route mentioned earlier from the adjacent newer pier. And here is my ride for the day, the Vega 120. As per media reports (Manorama Online) the Vega 120 has "two diesel engines of 340 hp each. Its top speed is 14 knots (25.9 kmph), while the regular service is conducted at 12 knots (22 kmph).Vega extends 25 m in length, 7 m in breadth and has a draft of 1.5 m. Its total weight is 24.56 tonnes". 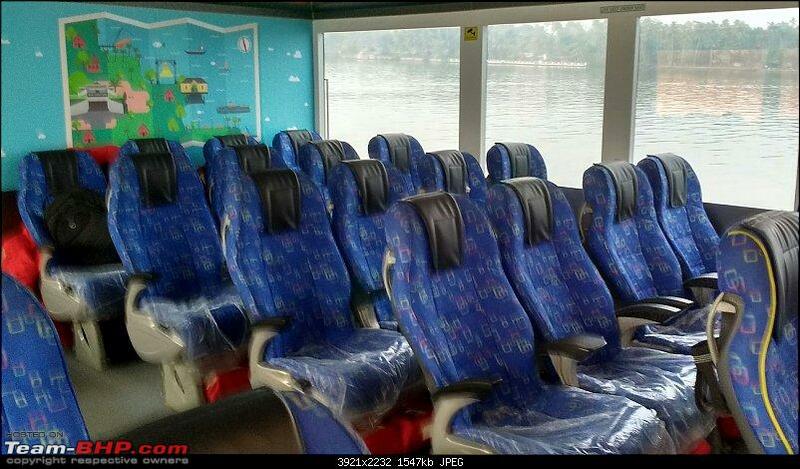 The ferry seats 120 passengers. 40 can be accomodated in the AC section and 80 in the non AC section. The ferry also has bio toilets. The AC cabin is configured 4 x 4 in 5 rows airline style replete with reclining seats and bottle holders. 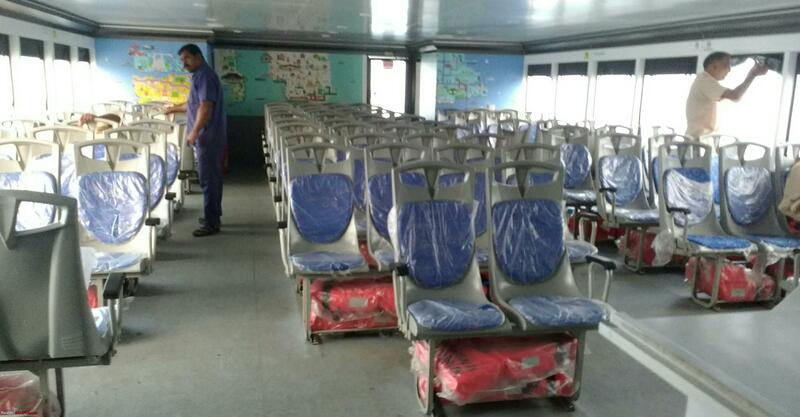 The Non AC section is configured 3-4-3 in a double aisle lay out with seats you find similar to JnURM commuter Volvo buses in Kerala. Both cabins have more than sufficient life jackets and fire fighting equipment and in the AC cabin I noticed that the hammers to break the emergency exit glass were in place. The emergency exits are clearly marked.There is a very basic snack bar on board. No wifi connectivity (it is planned) but mobile data network of both Airtel and Vodafone were good for almost the entire trip. For entertainment (remember this is primarily a passenger ferry), music is played in both cabins but at sensible volumes. 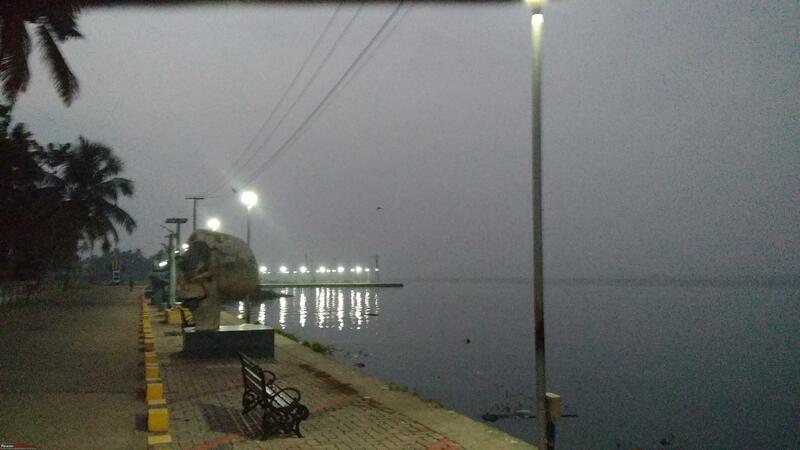 We were off from Vaikom on the dot at 0730. 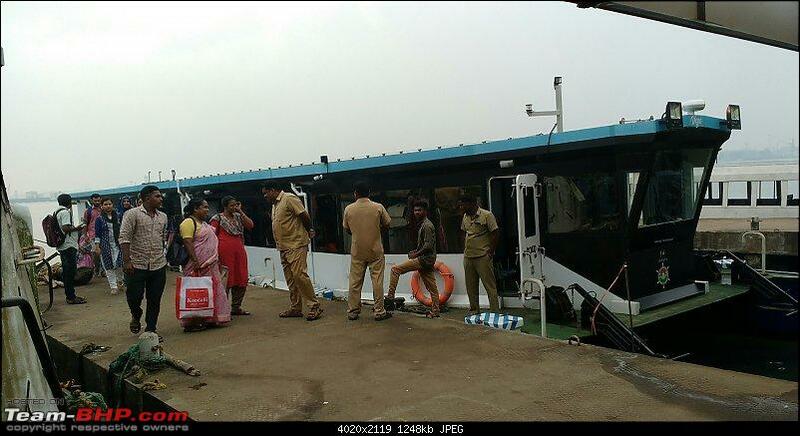 The ferry has a couple of intermediate stops at Perumbalam Island and Panavally before it reaches Thevera Ferry around 9 AM and terminates at the main Ferry Terminal in Ernakulam at 0915. 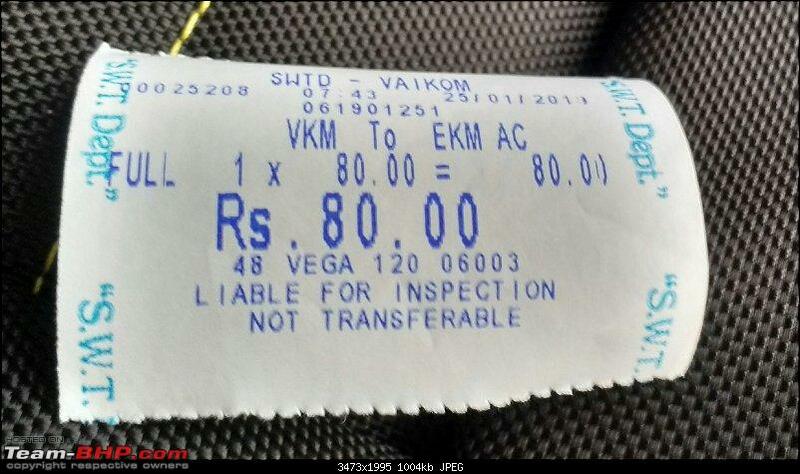 The cost is a very reasonable Rs 40 in the Non AC section and Rs 80 for the AC section. Tickets are purchased on board from the conductor. 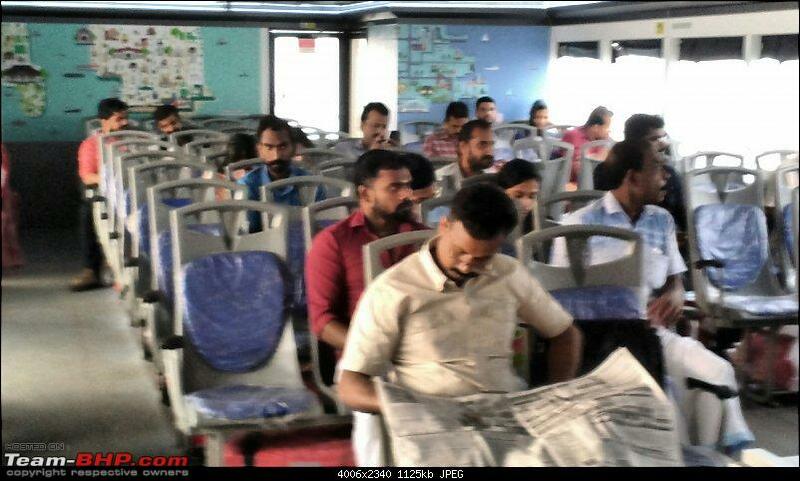 The ferry was only a third full when we left Vaikom. 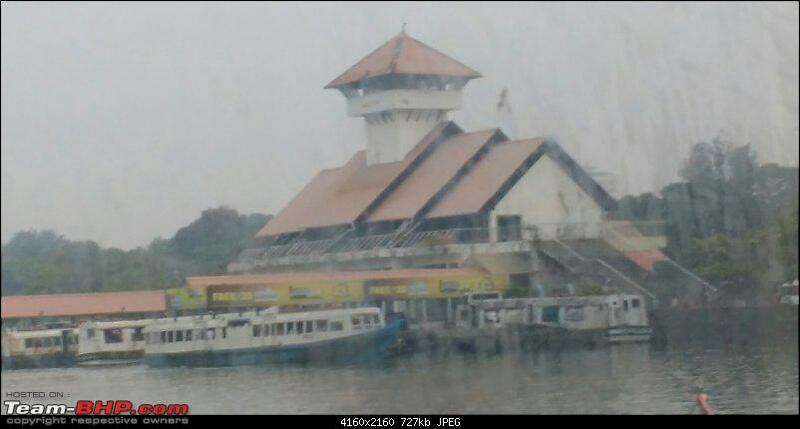 However the ferry but had good patronage from both Perumbalam Island which was reached around 0800 and Panavally by 0815. 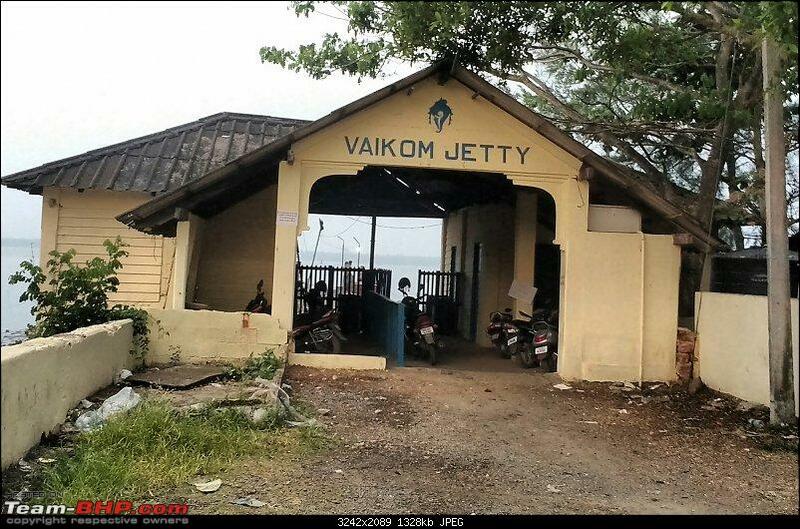 The ferry terminal at Panavally which is the gateway to Perumbalam Island as well as to Poothota near Thripunithura in the suburbs of Ernakulam. 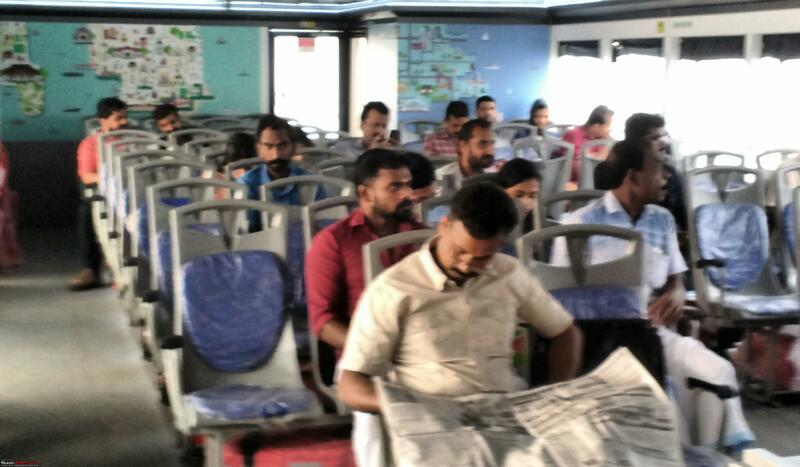 As we left Panavally, the ferry was quite full in the non AC section with local commuters. The AC section was not well patronised. 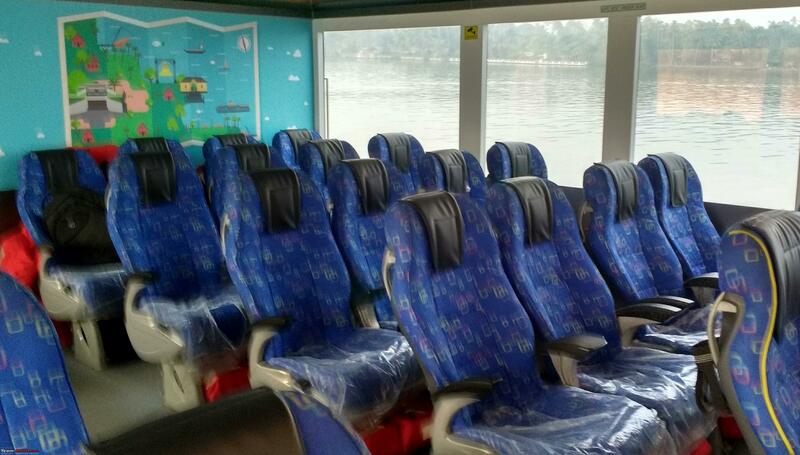 However according to the crew during the weekends, there are more passengers up front , mainly tourists. By 0845 we were approaching the outskirts of Ernakulam. And when high rises appear you know that Kochi is around the corner. 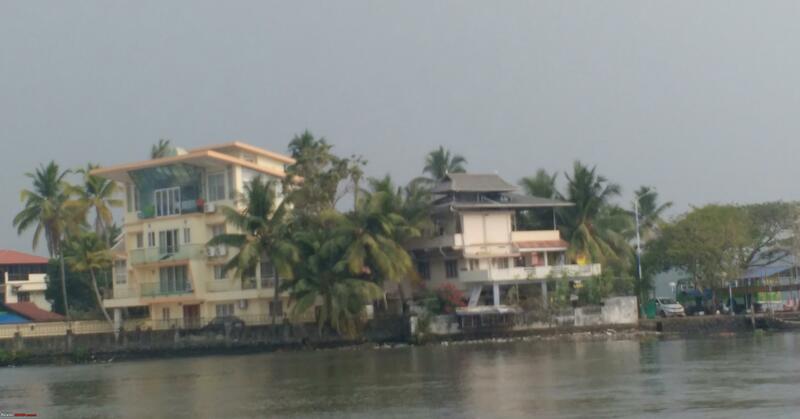 By 9 AM, we were approaching the Thevara ferry, in the Kochi suburbs which is convenient for Willingdon Island. 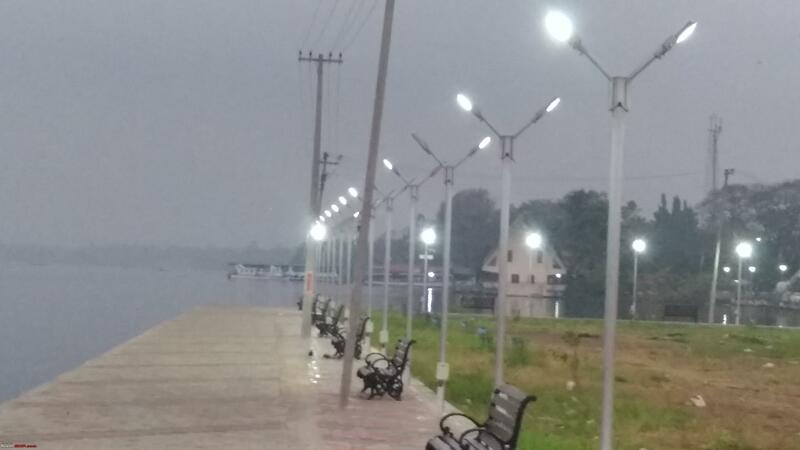 There are plans to extend the current Kakkanad-Vytilla ferry to Thevara to connect with the Vega service. And we berthed bang on schedule at 0915, the end of a most enjoyable trip. While at Ernakulam, the Vega does about six round trips to Fort Kochi , a far safer alternative than the regular ferries. 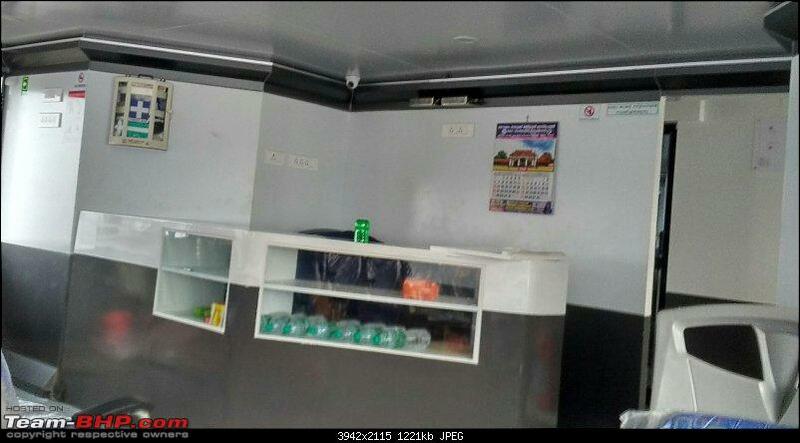 Tickets are 10/20 Rs respectively in the two cabins one way. Highly recommended for an "off the beaten track" experience of the backwaters. 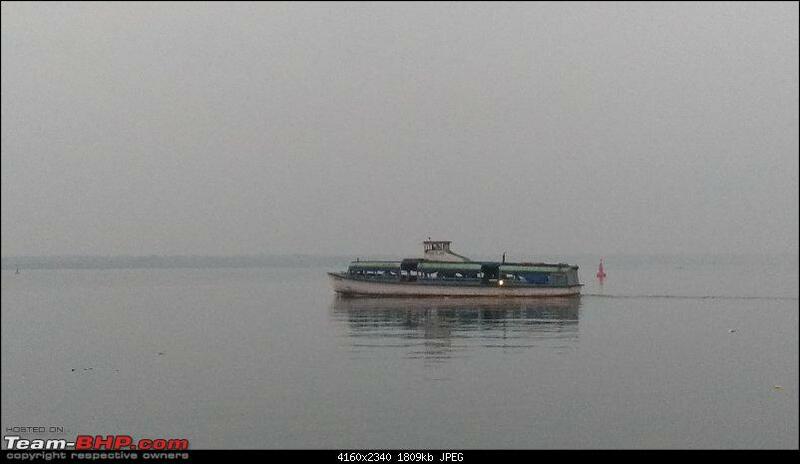 It is a hassle to reach Vaikom early in the morning but then Vega-120 is a commuter ferry and not a tourist service. 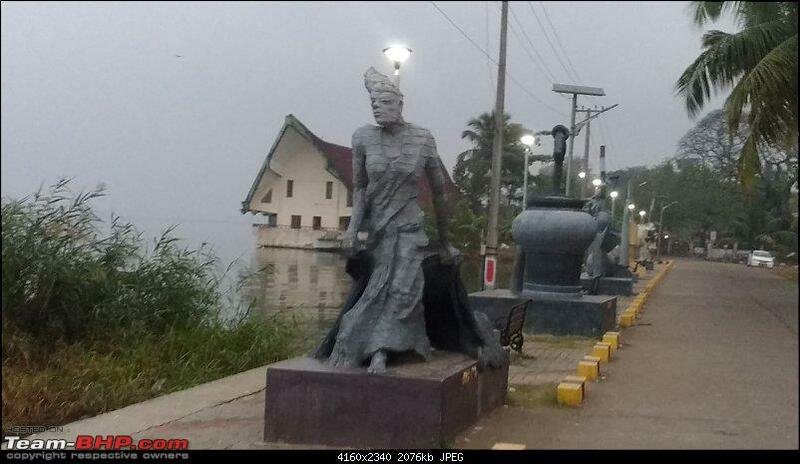 Yet another praiseworthy initiative of the State Water Transport Department of the Kerala Government. 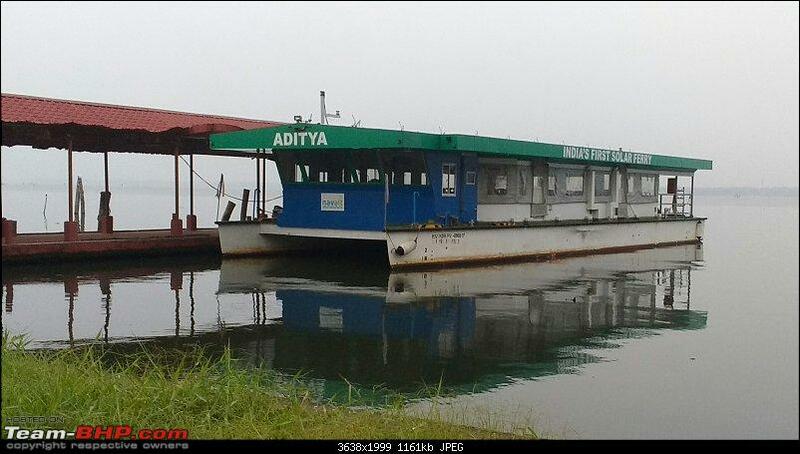 Another fast ferry (constructed by a different company) is expected to start services between Kottayam and Alappuzha in the coming months . Like the Vaikom- Ernakulam service . this one will operate short hops between Alappuzha and Kumarakam till the ferry returns back to Kottayam in the evening as per current plans. Other SWTD options for economical cruises (but poorly patronised and publicised) are "See Kuttanad" - Rs 80 Round Trip from Alappuzha to the village of Kainakari and the "long haul" Tourist service which does the 8 hour run on the Kollam Alappuzha route and costs Rs 400. My travelogues on both these trips have been posted on Team BHP earlier and these services are still very much operational. 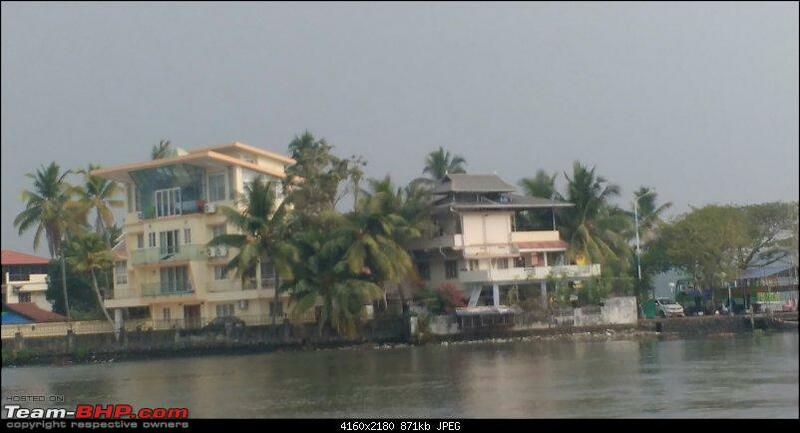 However in Alappuzha as soon as you are in the vicinity of the boat station (near KSRTC bus stand) you will be besieged by touts trying to discourage you from these government run services and pestering you to take their much more expensive and in many cases much less safe private boats. I would suggest that if you are not very particular about ultra luxury, do take some of the SWTD services which will also help the organisation to become financially viable. Last edited by TKMCE : 1st February 2019 at 00:13. It has taken me more time in car if I remember it right - though we take Thalayolapparambu - Poothotta route whenever we drive down that side. Good to see more boat services being introduced. Is the Vega 120 the boat they imported from The Netherlands? I had read about it but had also read about a lot of teething issues with the boat. Not sure if this is true. Our media can bloat things up quite easily. The issues I am aware of were from waste (like discarded fishing nets) oe the notorious "African Payal" getting entangled with the boat's propulsion mechanism but that is hardly the boat builder's or SWTD's fault. 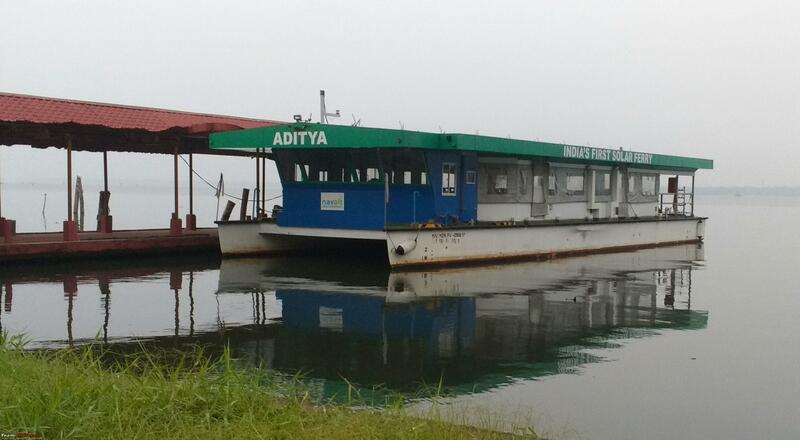 I am from Alappuzha and very happy to see a rust free boat run by SWTD. By the way, it seems we have quite a number of BHPians from Kerala. We should meet together once in a while. Thanks TKMCE for this write-up. Your threads on these lesser known modes of transport makes for very good reading. Especially the water way ones. Don't think we see such write ups anywhere else. Now they have inducted a few brand new boats for regular services from Alappuzha to places like Nedumudi/Krishnapuram etc . Saw a couple of them. Looks very impressive. QUOTE=Rajeevraj;4537841]Thanks TKMCE for this write-up. Your threads on these lesser known modes of transport makes for very good reading. Especially the water way ones. Don't think we see such write ups anywhere else. Thank you. I just wish more people patronise these services which costs a fraction of the private sector offerings and crewed by experienced and properly trained staff. Last edited by TKMCE : 1st February 2019 at 23:41. Thanks TKMCE for the valuable information on the new ferry service. I travel to Kochi with family at least once a year, and will try to fit in this boat ride next time. Looks a nice Value for Money option. The main issue is the timing. As mentioned this is primarily a passenger ferry. 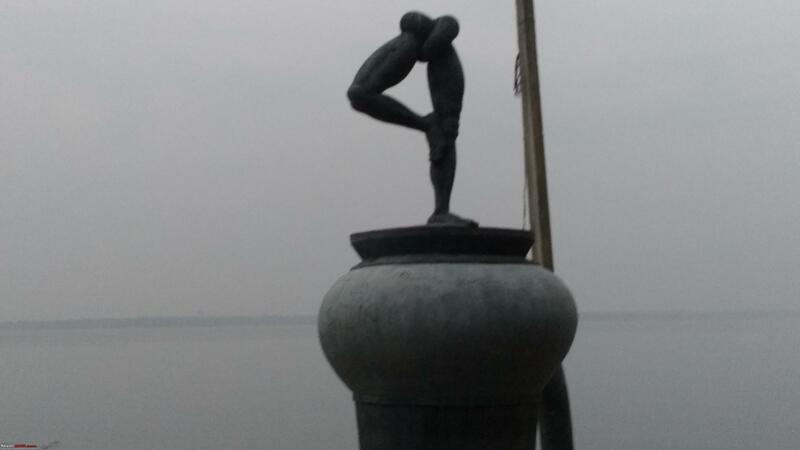 If you are combining with a visit to the famous temple at Vaikom and staying overnight this is a good option. However there is another government option (different entity), very well run from Kochi itself for a sunset cruise. Cost is Rs 400 per head for a 2 hour cruise, but still worth it and again very safe. I have done the trip - but it is a little too commercialised for my taste. But if doing the trip with family, this one may be a better choice, particularly if you love partying. Last edited by TKMCE : 8th February 2019 at 23:58. All times are GMT +5.5. The time now is 14:24.